Full disclosure: My granddaughter has zero interest in anything “girly” in nature, so I am left to cater to other people’s fantasies. Oh, well…c’est la vie. I recently found three pink painted metal dress forms on the clearance shelf at Michael’s marked down 80% from $17.99 to a much more palatable $3.59 each. I had no idea what I was going to do with them, but before I could say “plies and pirouettes”, I found myself making miniature tutus. Me! The grandmother of a child who, after seeing pictures of herself decked out in a feathered number for dance class that made her look like Big Bird, spent a considerable amount of time bulking up and went dressed as The Hulk for Halloween!!! I promise the candles aren’t crooked. They just oddly photographed that way! The tulle used for the tutus is ivory, so I used an ivory full-length linen and napkins. TIP: for real weddings and tablescapes: If the bride is wearing an ivory gown, best to go with ivory linens in the reception space so as to not make the bride’s attire appear dingy. Years of professional wedding plan taught me that little gem! I’m not a super fan of shiny runners at all, but they just seemed to work here. 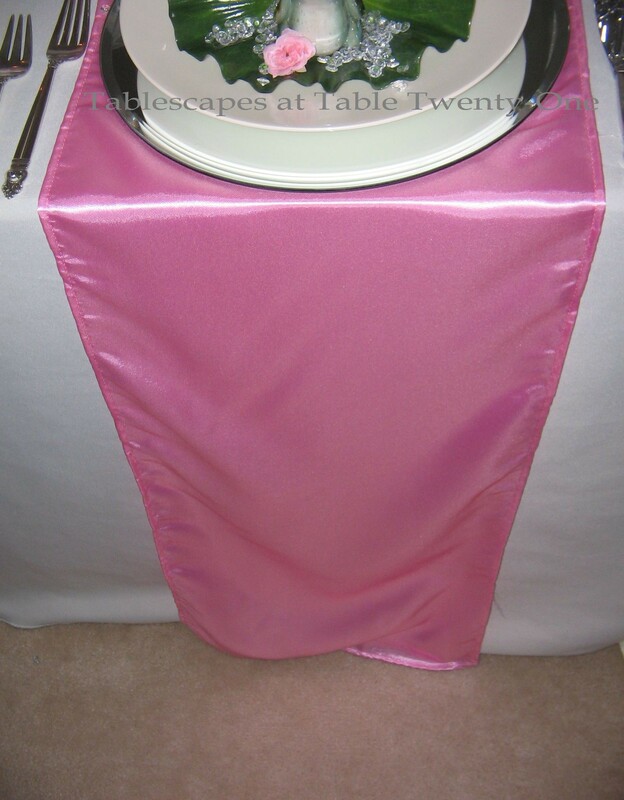 The blinding pink runners and creamy ivory linens are all from LinenTablecloth.com. I used 13″ round mirrors purchased a couple of years ago at Hobby Lobby as chargers and “10 Strawberry Street” ivory stoneware from TJ Maxx. Ivory dishes are a nice little addition to your collection as they come in handy when using ivory linens. You can buy cute lily pads like this from places like Michael’s or Hobby Lobby. Since “diamonds” are a major part of this overall theme (after all, they are a girl’s best friend whether she’s a bride, a princess or a ballerina! ), I sprinkled on a handful. I guess they could also pass for water droplets if you want to go that route! The tiny ceramic frogs are from 2011 stock at Hobby Lobby. A demure pink spray rose brings color and yet another layer of texture to the setting. 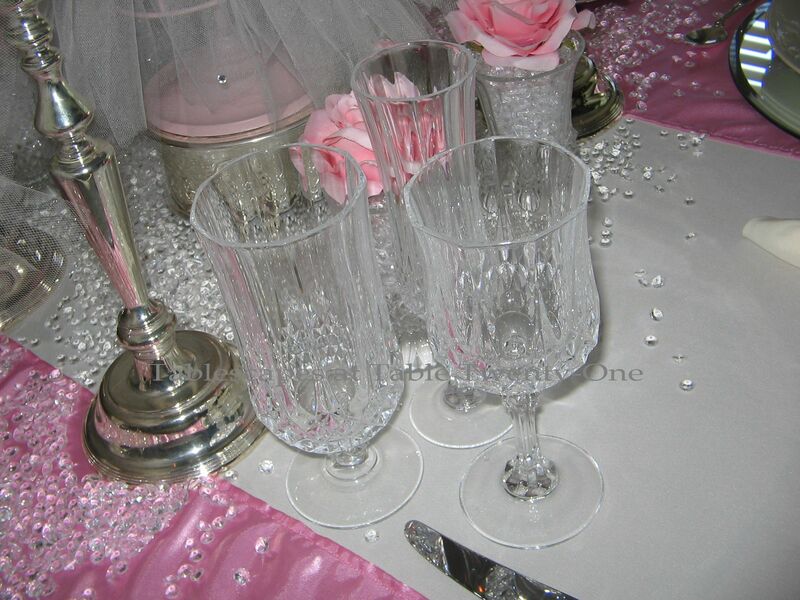 The diamond cut in the Cristal d’Arques “Longchamps” stemware is a perfect fit! 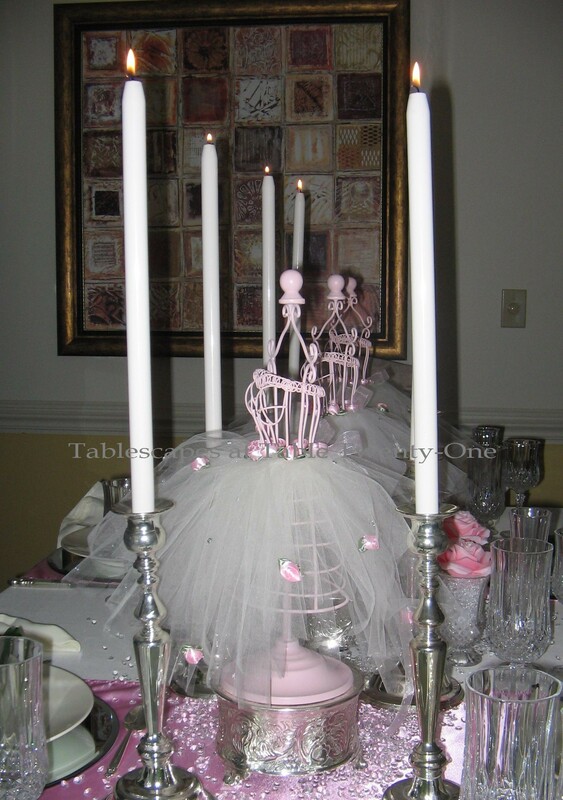 The centerpiece is a compilation of pink princesses, silver Revere candlesticks with ivory candles (you need to carry the ivory all the way through! 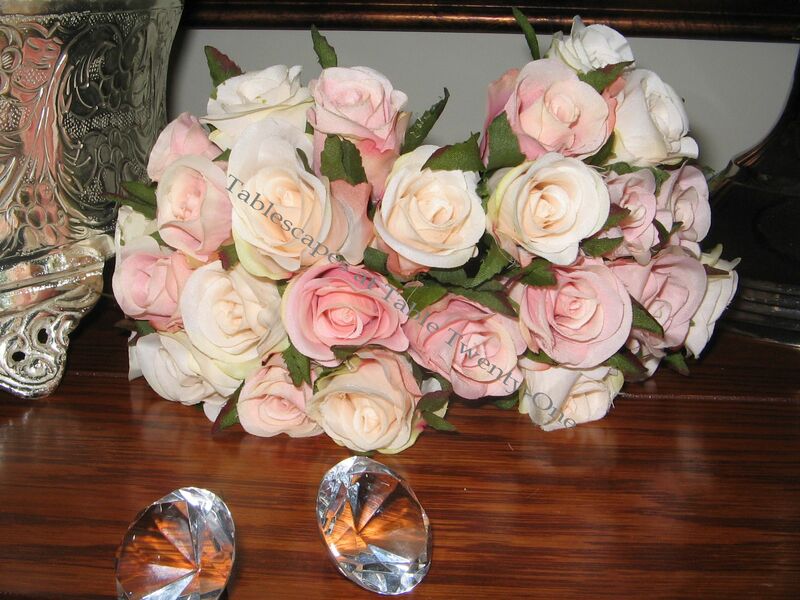 ), scads of “diamonds”, and pretty pink roses. Someday I may do a tutorial of my own on how to create a no-sew tutu, but in the meantime you can click HERE for Julie Figueroa’s very easy step-by-step instruction. It’s basically just tying strips of tulle onto a length of ribbon. Too easy…even for clueless, craft-challenged me! I hot glued silk rosettes to the waistline and sporadically across the skirt itself. Little rhinestones were a pain (literally AND figuratively!) to put on, but the results were worth the half tube of silvadene cream. 🙂 To lend a little height and put these princesses on a pedestal (again, both literally AND figuratively! ), I added 6″ silver cake plateaus/stands. (So sorry….I bought the cake stands wholesale several years ago and have no idea where to direct you to buy some this size.) A generous smattering of more “diamonds” runs the length of the centerpiece. Medium-sized pink roses are nestled into a sea of more of the acrylic “diamonds” that fill a Cristal d’Arques “Longchamps” mini vase. The final component of the centerpiece is a parade of 11″ silver Revere candlesticks. I used my trusty (ivory) 15″ Paradise metal case candles to avoid any messy drips and reduce the threat of fire that always exists…especially when using something so flammable as tulle! Metal case candles found at stores like Hobby Lobby are usually white, but you can ask your florist to get other colors and sizes for you. The exalted Frog Prince eyes the bevy of beautiful princesses from his perch on the buffet behind the table. A 12″ silver cake stand in the same pattern as those used to elevate the princesses gives him a little height. A larger lily pad is topped with a lacy ivory ring bearer’s pillow from the Beverly Clark collection. A trail of much heftier diamonds runs the length of the buffet along with clusters of soft pink roses. Notice that the silver candlesticks on the buffet are quite similar in shape (by design) to those used on the dining table to lend continuity. 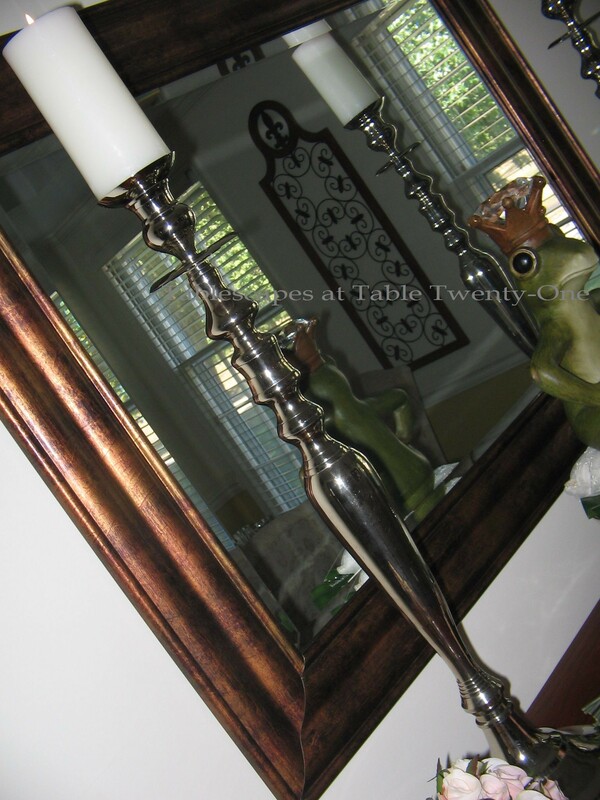 Ivory pillar candles are used to double back ambient light in the mirror. Maybe someday my granddaughter will decide she wants to be a fairy princess instead of a weird, angry, steroid-enhanced green dude. A grandmother can only hope! Come on over and join the party at Cuisine Kathleen’s “Let’s Dish!” anytime after 7:00 p.m. CDT on Wednesday! I’m also joining for the first time “Tutorials, Tips & Tidbits” over at Yvonne’s “Stone Gable” blog. Then be sure to join Susan and a whole bunch of my cool blogger buddies for “Tablescape Thursday” anytime after 9:00 a.m. CDT on Thursday. You’ll be glad you did! Alycia, this table is soooo awesome! 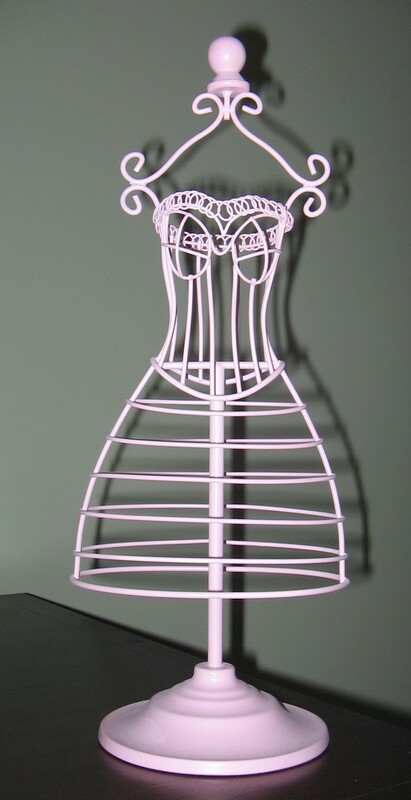 I have just spent a good portion of the morning looking at wire dress forms on-line because the that will be the decor for my quilting/sewing studio–dress forms and quilts that is. Then after serving lunch to my grandson, I come back and here’s your blog – with a theme using them! What a beautiful table! I love, love, love it! We have similar situation going on. Since I have a grandson–no granddaughters—there’s no “girly” things around here, with exception of my soon-to-be completed sewing studio! That’s why I was checking out dress forms; I’ll have to check out Michaels. I never would have believed you are old enough to be a grandmother!!! Wow!! Alycia, your table is wonderful. I wish I could look at things on sale 80% off and come up with a wonderful centerpiece like that! Love the scattered diamonds/water droplets!!! Such a great touch! Ok, this is just about the cutest table I have seen in ages. It’s classy, but cute! I think even teenage girls would like this, and little girls. The diamonds and frogs are perfect, and speaking of perfect…GRANDMA…..why not a bigger photo of granddaughter???? What a cutie. Too cute for words! 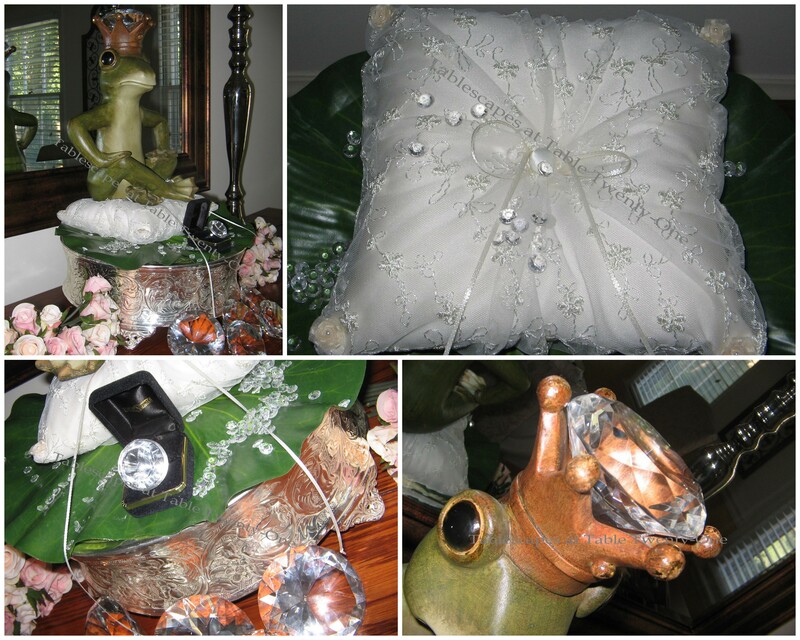 My favorite, although it is hard to pick one, is that frog sitting on the ring bearer pillow! We do have to kiss a lot of them to find the real thing don’t we? The tip about ivory and white is such a great one. WE were taught that in design school, but no one seems to pay attention to it any more. The only time it really works is when you mix many shades of white and ivory. Your princesses, or brides, are adorable!!! Wow, can I be the princess? Goodness this is magical. I would never have thought about the tutu’s but let me just say, you just turned these into treasures. Absolutely charming pieces.. I am totally blown away today. The pink runner in all their shiny glory are just perfect. Nice reminder on the tip with the ivory.. I tend to forget that most of the time. The pedestals are the perfect touch.. I love the silver and the crystal… every piece so well thought out. Alycia.. you are the queen! I loved this table.. totally. Luv it, sometimes I find myself in our clearance section at the store wondering what you can do with some of the items in there. Grandma sometimes the little tom girls grow up and turn into the princesses that you wanted years back. For your sake I’ll say a prayer. It’s perfection! Every detail is just lovely! I adore your handmade tutus and the ivory settings are perfect! Any future bride would be so excited to sit at your beautiful table! 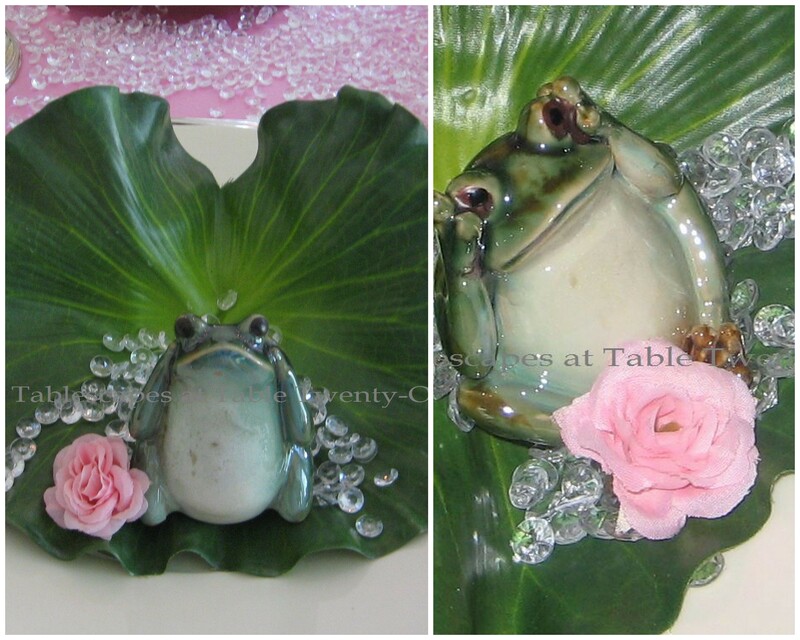 This is such a fairytale of a tablescape… frog and all! Just so girly and blingy and fun! Your centerpiece, the tulle adorned dress forms are just magical! They take this darling table right over the top! Granddaughter? OMGosh Alycia…you must have been a child bride! You’re lookin’ way too good to be a grandmother. 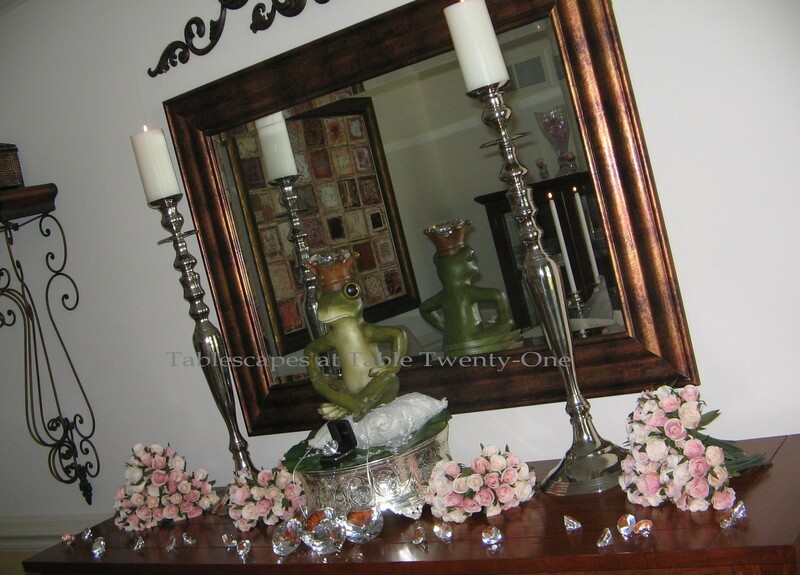 The tablescape is darling and I love the whimsical frogs. Too cute! Oh I do pink puffy heart this post! It’s so magical. Your granddaughter is adorable! Did she see this tablescape? How could she not love it? Bless her heart, the grandmother called her “Big Bird”. She looked so cute!! OMG ! I’m not a fan of the pink and fluffy look but this is to die for ! The frogs are so cute ! You never stop amazing me with your talent and imagination ! From end to end, I LOVE this one! I’m such a lover of pink and girlie so it’s right up my alley. I love what you did with the dress forms. I need to keep my eye open for some. Surely, I can use them! The roses in the stemware was my favorite delicate detail, but I loved the place setting from mirror to lily pad as well. Two enthusiastic thumbs up! Two more days to this very long month. I just read what your mother wrote about “your” beloved Royal Danish. She cracks me up! Being surrounded by testosterone in this house, I live for something fluffy and PINK!!! I love this table. Adding the skirts to the dress forms was a great idea. Love it. Can you imagine the look on the guys faces if they came in to see a table set like this…HA! Maybe I could set it for a lunch with the girls. 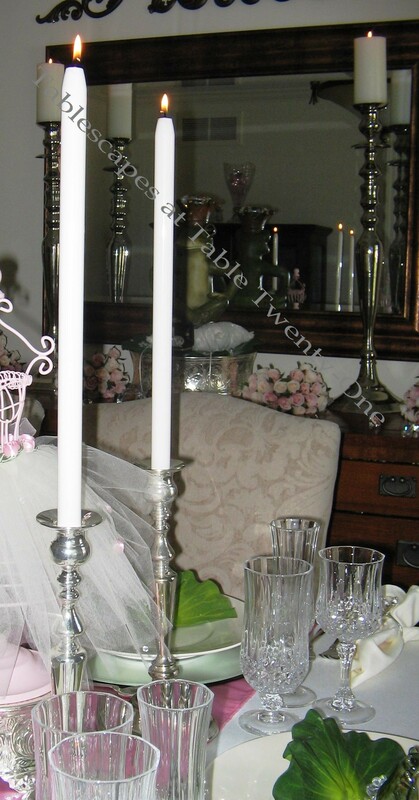 The little cake pedestals that you used to lift the centerpieces off the table are a great idea. Your attention to every little detail is amazing! You truly love what you do. 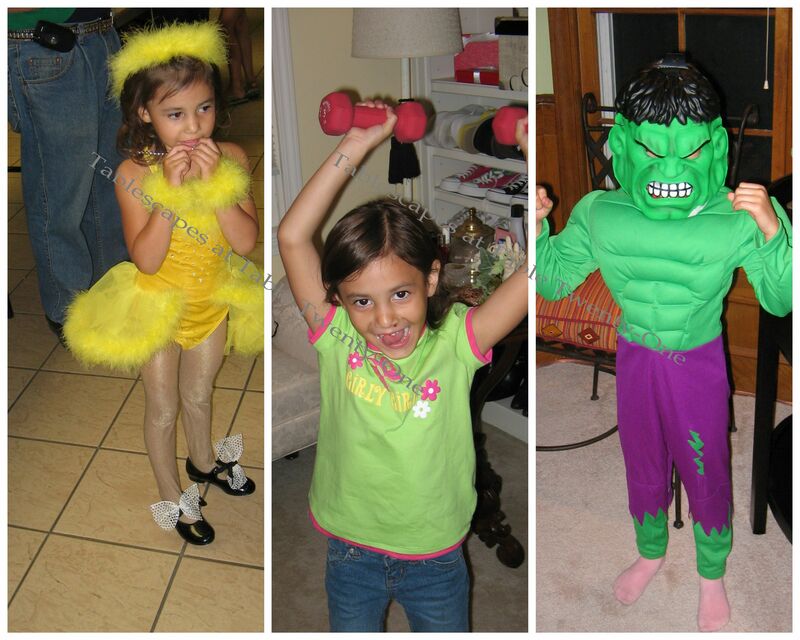 Your granddaughter is cute as a button and I love that she can be a dainty little dancer and also strong as the Hulk! This is so adorable. I love the dress forms all dressed in pink tulle. What a sweet theme for the party. Got a chuckle out of the big bird to the Hulk costume. Granddaughter is a cutie too. Too cute and girly for words. Love the great bargain pink dress forms. How adorable…perfect for a princess. She is a doll. Wonderful details with the sparkles and diamonds…..Love the Frog prince too. Those costumes are so stinkin cute………Love it all. Such fun! Your gran is precious. What a delightful table. I haven’t watched the movie and I must ask my granddaughter if she has. She loves anything about a princess. Your idea about dressing the form in tulle is darling. I know you have to be such a fun person because your personality and talent in tablescaping is fun and creative. Even the flames take on a pinkish flicker. Just fabulous. Alycia, your granddaughter is so cute. I’ll bet she’s a pistol. Thanks for sharing the photos of her, and your table is wonderful. BTW, I also like that you always decorate your buffet to go along with the theme of the table. I hope you have a great week! I had no idea you were a grandmother! Love the table, so pouffy and fun! and I particularly love the frogs! Well I knew it was going to be a tablescape you were making tutus for but I didn’t imagine this scenario! It’s beautiful and so fantasy like! I could totally see this for a girls birthday party too! The forms with the tutus are adorable! Afterwards a young girl could even make them into a jewelry holder for necklaces etc.! I love all the faux diamonds spread out and the frog & lily pad! Your brain is in overdrive! I can’t imagine how you came up with this! Great job! Amazing! I never thought of the 13″ mirrors as chargers! I have a few at home myself! I love the lily pad and frog!!! Your granddaughter might not be a girly girl Alycia, but she is definitely a beauty! I can’t believe you are a G’ma! 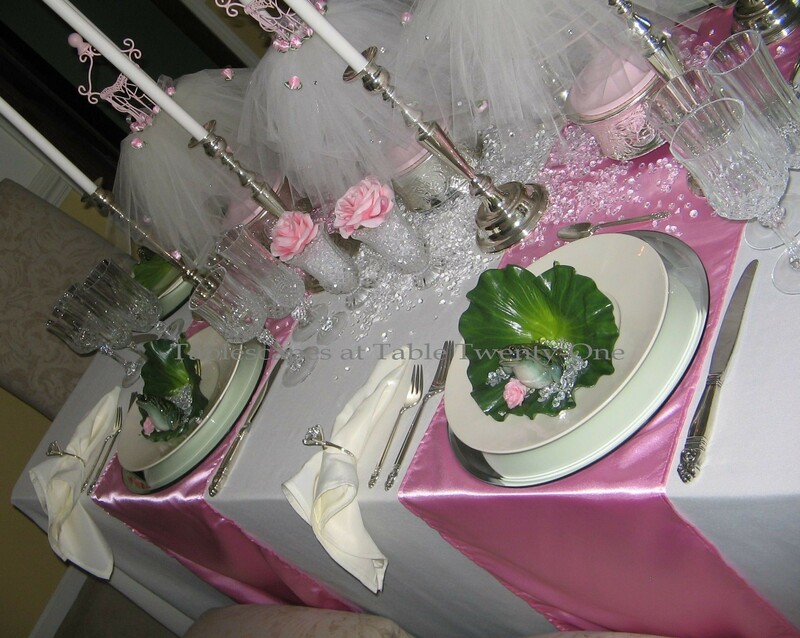 Your table is gorgeous…the ballerinas are genius!! I love it all! OMGosh, Alycia, this is my very fav of all!!!!!! I LOVE the darling little tutus and the frog and the lily pads and the diamonds and the roses and and and…..etc., etc. You have thought of everything!!!! You are such genious my pretty friend! No one can top you with designing a table for whatever theme. I love it, I might just show this to my daughter for her 5 year old’s birthday, as she is a ballerina and loves it, she walks around wearing a tutu. The frog and lily, the tule table, dimonds and roses and mirror chargers, sheesh..I WANT A BIRTHDAY LIKE THIS, PETTY PLEAAAAASEEEEEEE!!!!!!!!!!!!!!!!!!!!! !You are a genious!! Gorgeous grand too, like her adorable granny, so much fun and both are lucky to have each other, you must be the greatest granny of all too!!!!!!! Hope you come over and hope you’re feeling better and Ramon is a little at ease with you and the computer. Luv ya! Love the tutus with the gathered tulle. You better watch that glue gun, hope it was a low temp one. I have had some nasty burns from a glue gun making pine cone wreaths. My daughter was a dancer from age 3 into college so I love tutus and tulle. 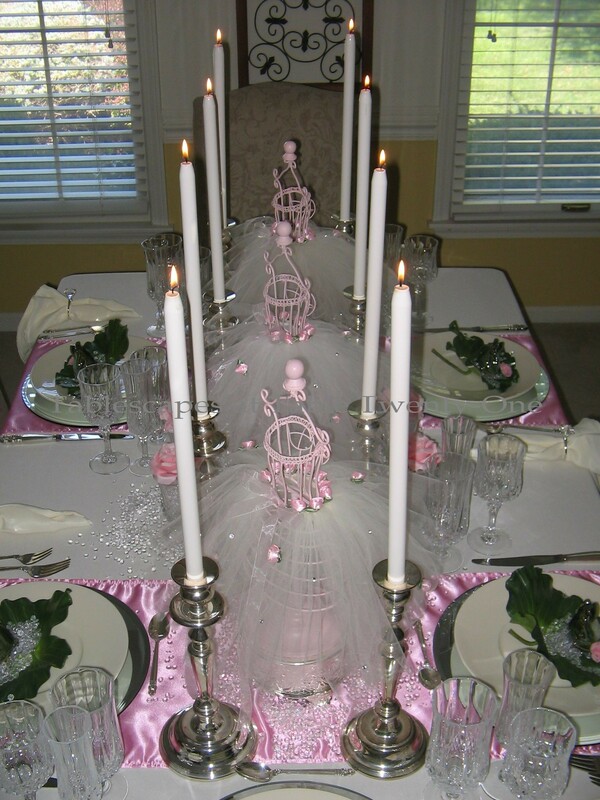 Such a sweet grandmother you are to create such an outstanding table and party. I bow to you my friend for such a gorgeous table for the wedding shower. Oh wow! I love what you created here, Alycia. It is like a fantasy land, so pretty, so girly girl. My granddaughters (though 3 of them are too young) would love them. Alycia, this is so flippin’ adorable, I don’t know where to start! If your granddaughter isn’t converted by this table, there is no hope! Your princesses turned out so cute, you may have missed your calling. Nah, ballet seamstress doesn’t sound like much fun. After seeing Black Swan, I can’t even watch a ballet! Your frogs sitting in a lily pad of diamonds is so creative, too! Seriously, your table makes me want to be eight again! LOVE your frog prince, and the way he is lording it over the room! It looks like you had fun with this one! Wow, you are so creative, Alycia! I think this table is so beautiful, even with all the pink! Hi Alycia, thank you for your visit! They are bushes. I have to drive about 25 miles to the blueberry patch, but it is soooo worth it! They are very sweet this year, and they rent bees to pollinate them. The people that have the blueberry patch are retired teachers, and have been doing this for about six years. I have not missed a year!! I had to come back for another visit to see this beautiful, pink table! Love this table and you already know how much I love your flatware!!! But your grand daughter in the Hulk costume is just too much!! Hilarious!! Oh my, the little ballerina dolls are precious. What a great idea!! Your creativity is always so beautiful and impressive. This is the nicest table yet.I love what you did with the dress forms.You were lucky to get such bargain.They made the table like a fantasy. the girls will love it. I so love this table. I want to be a princess at your house. Are there “old” princesses? 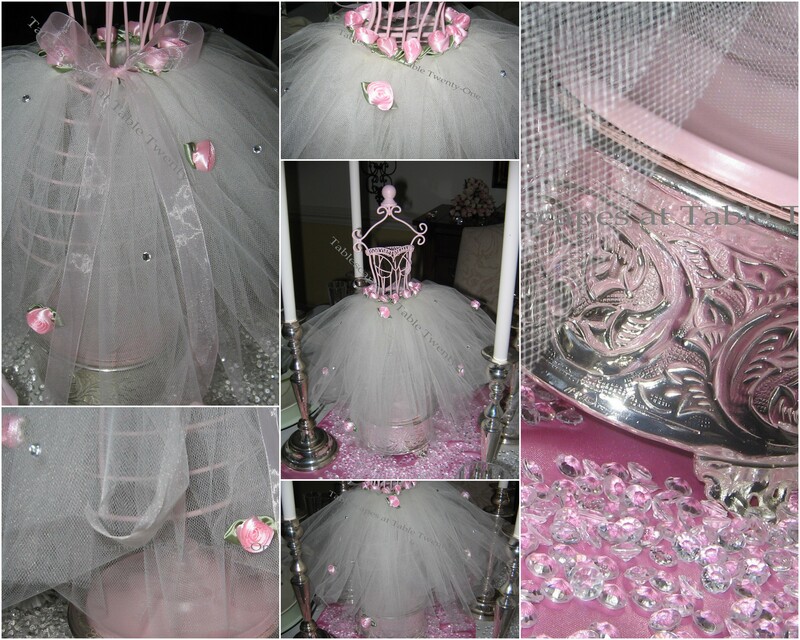 I want one of those lovely tutus.The pink roses are luscious and I have always love the Royal Danish silver pattern. Another fabulous table with your special touch. WOW!! Perfectly girly. So fun!! Oh my dear, this table leaves me speechless! You really went the extra mile and it suits my princess fantasy to a tee. I am so glad there are people like you who go the extra mile to make things special. Your effort is a treat for us all. Alycia, my daughter would have loved this table for a party, she is a dancer and very much a girly girl but all grown up now. I find it hard to believe you are craft challenged!! they came out beautiful!! Had to laugh at your Black Swan Shower suggestion!! Too funny! I’m out of town for work reading blogs from my hotel room, a good way to relax after a long day, Posts like Your’s make me smile! Thanks! This is the just precious and very, very creative! I have always loved ballerinas and the tuttus are just perfect on the metal forms. You are a very talented person and to tie in the frogs for the frog prince was great. 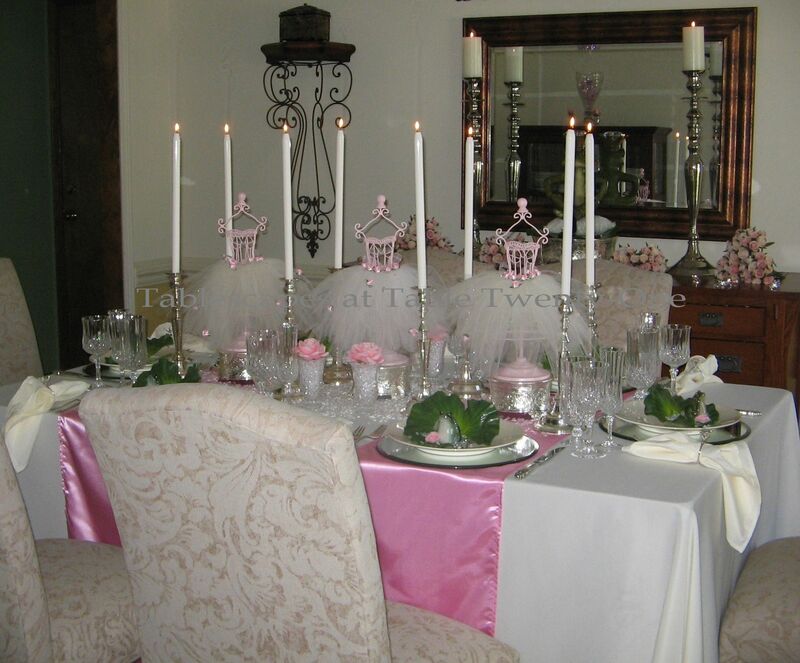 The tablescape was wonderful with the white, pink and a touch of green for I just loved it. Please, be kind enough to visit my blog for a tablescape I did for my husband! Holy Tutu! That is just beautiful! What a creative use of those Michael’s bargains! That is a dream come true! I would love to a table like that for my gdau, she does take dance, but loves lacrosse, and swimming and sports. I think she would like a sports theme, but I like this! Cute center piece runner idea. The table looks wonderful. Wonderful tablescape. Absolutely delightful table setting Alycia! I know the tutus should be center stage, but I am completely in love with the frogs…I love the whimsy they bring and the story they help tell :~) Beautiful! Z Gallerie is truly one of the happiest places on the planet. Unfortunately we don’t have one here. Love this girly table. One again you’ve totally hit it out of the park! I always see those forms and wonder what to do with them. Now I want one. So pretty and the frogs are perfection – never thought I’d say that about a frog! Only for YOU. Such sweet table settings. I love all the pink accents and the cute tutus. This is soooo girly-girly, love it, so would our granddaughter! 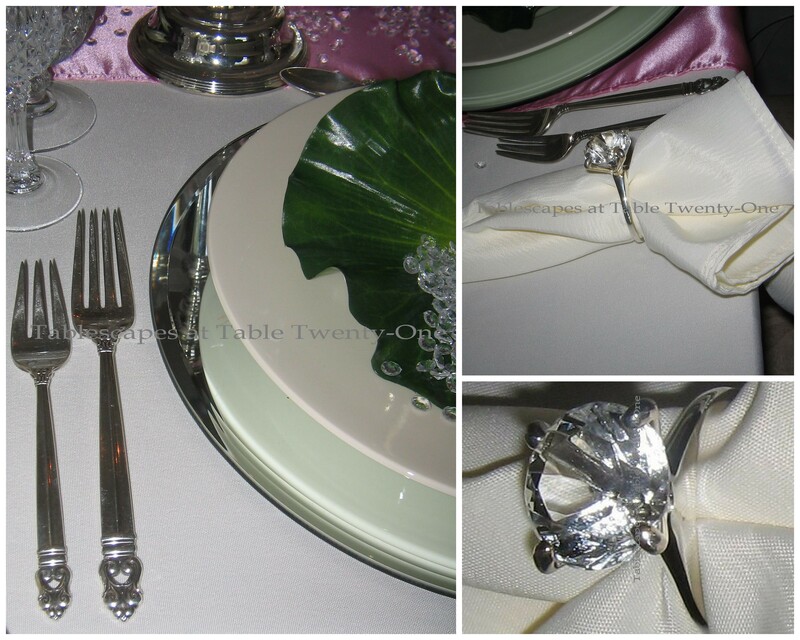 The diamond rings on the napkins are fabulous! 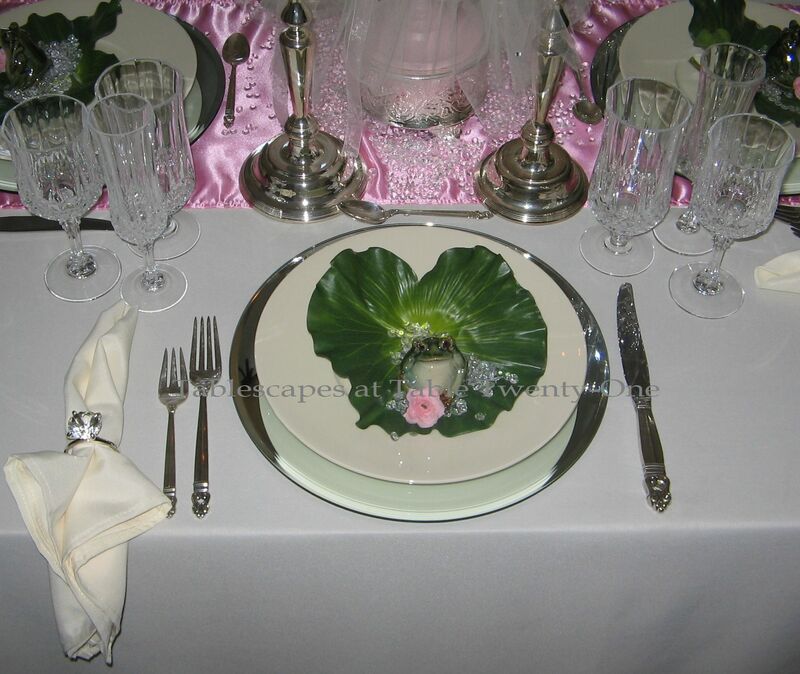 Love the frogs on the place settings as a contrast to the pink and bling. Utterly cute. If it were a kid’s birthday party it might be fun to let the other little guests have their own “birthday wish” if they kiss their frogs after the birthday girl gets her wish from blowing out the candles on the cake. Beautiful tablescape! You are so talented. Love everything. 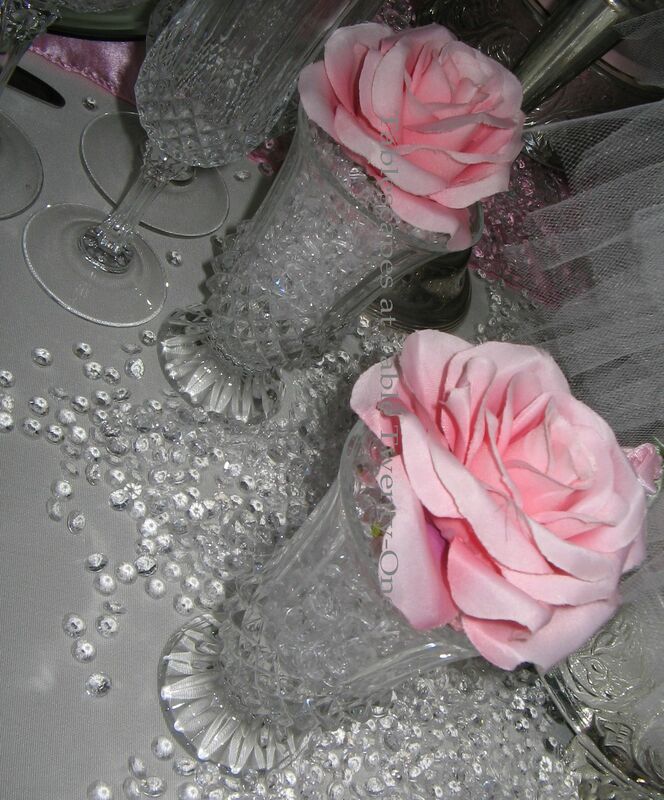 The pink is a favorite of mine and of course, the diamond napkin holders!! was wondering if u still had the dress forms and if u would consider selling them to me? please email me and let me know.